ORGANISERS of the Hyndburn Business Awards will be seeking to recognise the dedication of businesswoman Evonne Harwood following her sudden death. 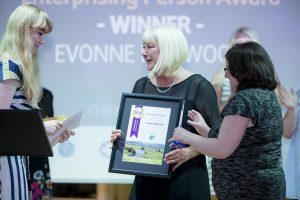 The owner of the Pink Magpie Vintage Emporium won the Enterprising Person Award at last year’s inaugural business awards for her dedication to improving Warner Street with events and attractions. She died in April. The number of nominations doubled this year and almost twice as many deserving businesses, individuals and organisations were put forward for an award. The presentation night will be at Accrington Town Hall on Tuesday June 13 when a team from Accrington and Rossendale College will be preparing and serving a delicious two course meal. In total 16 awards will be presented on the night and judges will now meet up to determine the winner of each trophy. The finalists for the Stonehouse Logic Award – the beacon award presented to the most inspirational business – will be announced on the evening.